LIAM WILLIAMS BELIEVES his March 8 British title challenger Joe Mullender is overplaying his hand ahead of their highly-anticipated showdown with continual claims that he will simply drag the champion into a punch-up. The pair clash at the Royal Albert Hall, with Williams making a first defence of the middleweight title he won in considerable style against Mark Heffron in December. Mullender, a self-confessed slugger who likes to get up close, is confident he will be able to draw the more refined Williams into a scrap and insists it is the only way he knows. Williams, for his part, says he is tiring of the back-to-basics rhetoric and is now even more determined to outclass what he considers a more limited opponent. “Yeah, ‘I’m gonna punch him in the face – he’s gonna punch me’, it is getting boring now to be honest with you,” stated the 26-year-old former British super welterweight champion from Clydach Vale. “At first maybe I was, not overlooking him, but I’ve always thought from day one that I am going to beat him fairly handily. Now, with him playing whatever card he is playing, it has motivated me even more because I just want to punch his head in. The 19-2-1 Williams contends that Mullender cannot have it both ways when, on the one hand, he claims it is just a fight while, on the other, it is the biggest occasion of his career with the treasured Lonsdale belt at stake. The punch traffic, he adds, will be in one direction only. “Yeah, exactly, he is just a bit boring and what I have seen is him keep saying we are going to punch each other’s heads in. Not at all, he is not going to punch my head in, I’m just going to beat the f**k out of him and go home still as British champion – and move on unmarked. 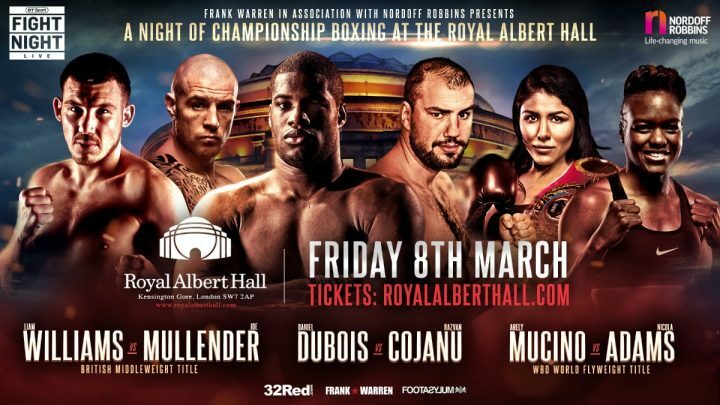 The British middleweight title clash between Liam Williams and Joe Mullender is part of a huge night of boxing at the Royal Albert Hall on Friday March 8 that also features young heavyweight star in the making Daniel Dubois’ 10th fight against former world title challenger Razvan Cojanu, along with WBO world No.1 ranked light heavyweight Anthony Yarde defending his Intercontinental title against Baltimore’s Travis Reeves. Also on the card, British welterweight champion Johnny Garton makes a first defence of his belt against the Welshman Chris Jenkins, while unbeaten featherweight Lucien Reid takes on his toughest test to date against Birmingham’s Indi Sangha. Unbeaten prospects Hamza Sheeraz, Denzel Bentley, Jake Pettitt, James Branch jr and Harvey Horn also feature on the show.